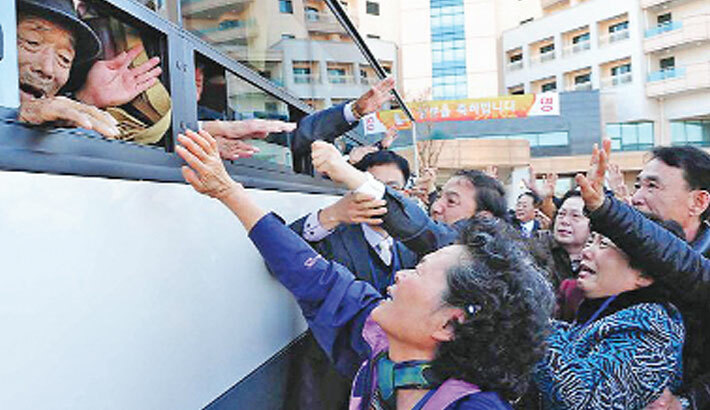 SEOUL: South Korea will seek discussions on resuming reunions of separated families at this week’s inter-Korean talks, Seoul’s top delegate said Monday, as the North trumpeted the importance of achieving reunification, reports AFP. The two Koreas agreed last week to hold their first official dialogue in more than two years and will meet Tuesday at the border truce village of Panmunjom. The talks will largely focus on the North’s participation in next month’s Winter Olympics in the South, but the two sides are also expected to bring up their own issues of interest. “We will prepare for discussions on the issue of separated families and ways to ease military tensions,” Unification Minister Cho Myoung-Gyon told reporters, according to the Yonhap news agency. Because the 1950-53 Korean War ended with an armistice rather than a formal peace treaty, the two Koreas remain technically at war. Tensions soared last year as the North made rapid progress on its banned weapons programmes, launching ballistic missiles it said are capable of reaching the United States and carrying out its sixth nuclear test, by far its most powerful. Their tentative rapprochement comes after North Korea’s leader Kim Jong-Un warned in his New Year speech that he had a nuclear button on his desk—but also said Pyongyang could send a team to the Winter Olympics in Pyeongchang. Seoul responded with an offer of talks, and last week the hotline between the neighbours was restored after being suspended for almost two years. South Korean Foreign Minister Kang Kyung-Wha said the North’s participation in Pyeongchang would strengthen the Games’ profile as “a peace Olympics”, Yonhap reported, and could lead to further progress. North Korea’s state media has stopped condemning the South and instead called for “independent reunification” without relying on other countries such as the United States. “The master of improved inter-Korean relations is not the outsiders but the Korean nation itself,” the North’s official Korean Central News Agency said at the weekend. “The flunkeyism and idea of dependence on outside forces are the venom which makes the nation slavish and spiritless,” it added. US President Donald Trump said at the weekend that the rare talks between the two Koreas would go “beyond the Olympics” and that Washington could join the process at a later stage. Also in recent days, the United States and South Korea agreed to delay annual joint military exercises until after the Games, apparently to help calm nerves. The regular joint drills have been criticised by some as heightening regional tensions. Beijing and Moscow have both called for them to be suspended.